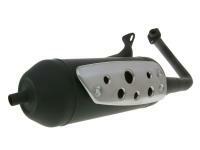 This is an A+ Rated replacement Muffler for your stock Piaggio at significant savings over a Piaggio OEM replacement. Tecnigas is one of the best known muffler and high-performance quality exhaust manufacturers from Barcelona, Spain. If it says Tecnigas you know it is FAST!!!! !